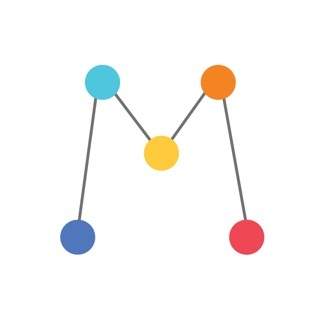 Mood Pixel is a minimalistic app that keeps track of your emotions, moods, thoughts and general well-being. Moreover, Mood Pixel accompanies you throughout your year and gives you knowledge about yourself that you might have not known before. I just want to tell you that there are ◆ NO ADS ◆ in the app. Data is saved ◆ LOCALLY ◆ on your phone so that you don't need to worry about others having access to it. This app was made for fun and so it shall stay. Complete 3 quick questions each day and allow yourself to gain knowledge on HOW and WHAT you feel through time. • 1. Select a general mood. • 2. Select up to 4 emotions you felt. • 3. (optional) Write a note of anything important to help you remind that day. Over time you will see the calendar fill out with the colors that reflect your mood and emotions. Likewise, you will be able to recall past days and know exactly WHY and WHAT you felt on a specific day. Call it an emotional diary. These features will help you understand yourself better by letting you identify the things that are lifting you up or dragging you down. 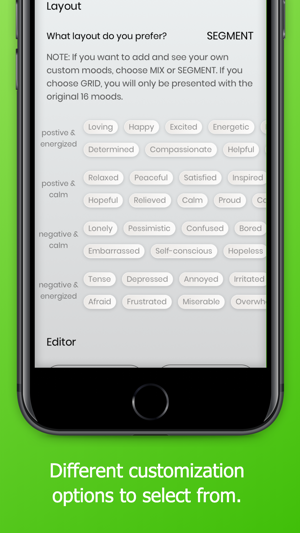 Moreover, Mood Pixel uses a model of modern psychology that covers the most common moods to help you describe your emotions. ◆ Journal Mode: Read all your entries at once like you would in a diary. 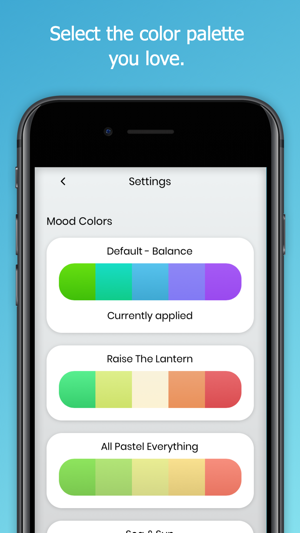 ◆ Mood Color Palettes: Choose the color palette of your choice and personalize your moods. ◆ Mood Manager: Create and customize your own moods as well as their layout. ◆ Statistics: Get to know your yearly and monthly mood averages. ◆ And a lot more! • Background Manager: Customize the background the way you like it. • Inspiration Mode: Enter 'Zen' mode and write everything with no obstructions. This is a great app, and the fact that it’s free is the best part. It’s also super customizable. 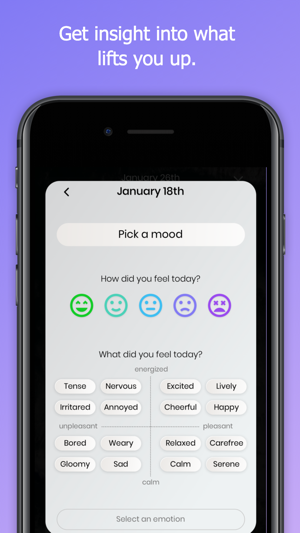 However there’s one thing missing; when selecting a “How did you feel” mood for the day, you have a happy to sad spectrum (these are the colours that show up on the calendar view), however, there isn’t an option for an angry or upset mood. 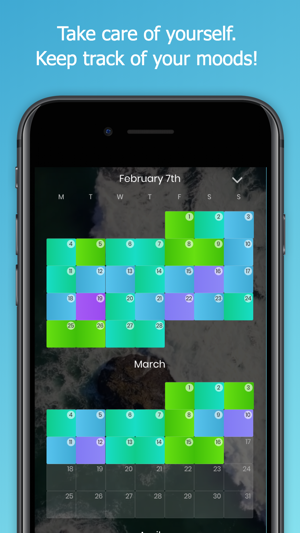 You can add that emotion in the extra moods, but from the calendar view you won’t be able to tell. I hope the Dev Implants a mad or angry mood, because I’ll have to use “Depressed” in order to stand out from the mostly neutral moods I normally have. I highly recommend this app if you struggle with depression and anxiety, or just anything at all. 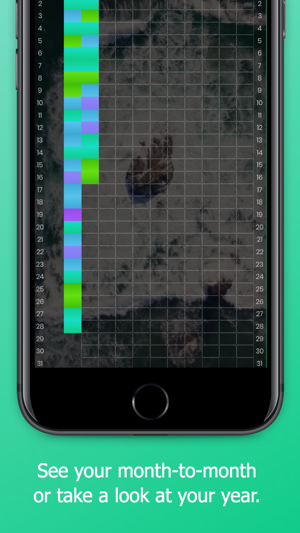 Almost everything is customizable, from the color of the pixels, to the moods, and even the background! One thing I’d like to see is being able to change the color of the calendar. I typically keep my phone screen at the lowest option and even have reduced white point on. It’s quite tedious to have to turn my brightness up to see the calendar. Other than that, I recommend the app 100%! I give this four stars. It's pretty good, and very nice, but what would make it a solid five for me would be the ability to create multiple entries in the same day, instead of editing a pre-existing one, and then based on your average mood, it will be that colour. And maybe if you had two neutral and two good, it would round up to good for the day? I dunno, I'm spewing bull, sorry. It's great and I definitely recommend it.